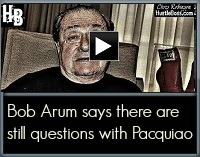 HustleBoss.com’s Chris Robinson speaks with Top Rank CEO Bob Arum about the recently-announced April 12 matchup between Manny Pacquiao and Tim Bradley. 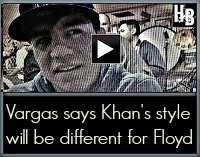 HustleBoss.com’s Chris Robinson speaks with welterweight contender Jessie Vargas (23-0, 9 KO’s), who shares his insight on the possible Floyd Mayweather vs. Amir Khan matchup. HustleBoss.com steps inside of the Long Life Fit Gym in Las Vegas, Nevada as junior welterweight Johnny Garcia (18-1, 11 KO’s) puts in work with trainer Vince Parra ahead of his scheduled matchup vs. Jermaine White. On Thursday night, Jan. 30, inside of the Barclays Center in Brooklyn, New York, Luis Collazo scored an emphatic upset win over Victor Ortiz in a battle of former welterweight belt holders. 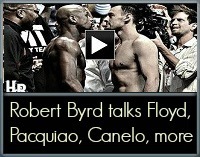 The fight was fought at a brisk pace early, with each man having success landing sharp blows in the first frame. 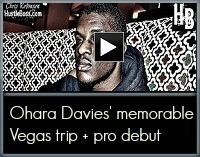 Chris Robinson speaks with London’s national amateur champion Ohara Davies as he reflects on his latest trip to Las Vegas, his time sparring at the Mayweather Boxing Club, his best memories this trek, and his thoughts on turning professional. 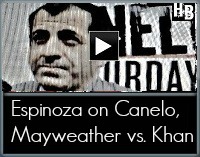 HustleBoss.com’s Mohamed Ali speaks with Showtime Exec Stephen Espinoza about the possibility of Floyd Mayweather facing Amir Khan on May 3 and the March 8 return of Saul Alvarez against Alfredo Angulo. 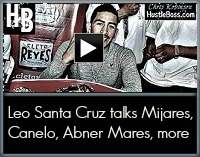 HustleBoss.com’s Chris Robinson speaks with former two-time junior featherweight champion Israel Vazquez about the upcoming rematch between Tim Bradley and Manny Pacquiao, set for the MGM Grand on April 12, 2014. HustleBoss.com speaks with junior welterweight prospect Donte Strayhorn (4-1, 3 KO’s) inside of 50 Cent’s personal gym in Las Vegas following his sparring with Johnny Garcia and Rahim Gonzalez. 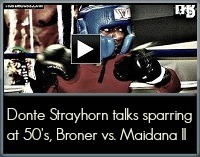 Check out the interview for Donte’s thoughts on his work, having 50 Cent as his promoter, upcoming matches such as Floyd Mayweather’s next fight and Adrien Broner’s rematch with Marcos Maidana. HustleBoss.com’s Chris Robinson speaks with amateur champion Sharif Rahman inside of the Mayweather Boxing Club, as he discusses what it was like growing up with a heavyweight champion father in Hasim Rahman, plus thoughts on today’s heavyweight landscape. HustleBoss.com steps inside the Mayweather Boxing Club as brash London prospect and national amateur champion Ohara Davies gets some work in with one of our gym favorites Kevin Johnson. Chris Robinson catches up with referee Robert Byrd in Las Vegas at the Mayweather Boxing Club, as he speaks on the city’s run of upcoming fights with Saul Alvarez vs. Alfredo Angulo, Manny Pacquiao vs. Tim Bradley II, and Floyd Mayweather vs. Amir Khan, which isn’t official yet. 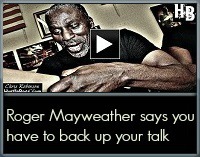 More coverage from the Mayweather Boxing Club as outspoken trainer Roger Mayweather reacts to the trash talk between J’Leon Love and Denis Douglin. HustleBoss.com steps inside of the Mayweather Boxing Club as amateur prospects and soon-to-be professionals Junior Saba and LaDarius ‘Memphis’ Miller put in some rounds. 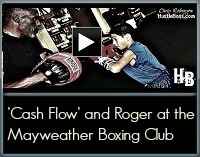 HustleBoss.com steps inside the Mayweather Boxing Club with upcoming prospect Floyd ‘Cash Flow’ Diaz. 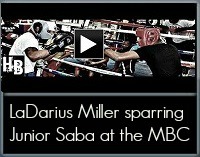 Check him out as he hits the mitts with Roger Mayweather, works out with Zach Cooper and Kevin Newman, and more.